Microsoft Outlook 2013 is the most recent version of Microsoft Outlook – a component of MS Office suite and the most preferred email client across the globe. 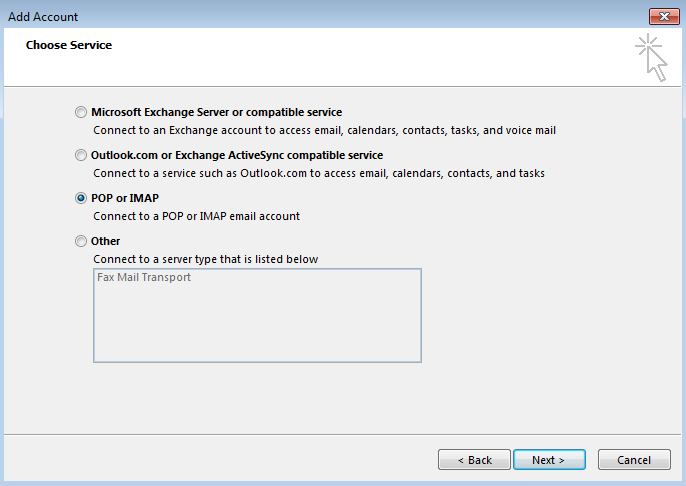 MS Outlook supports IMAP/POP3 and Exchange accounts, thereby enabling you to configure your Gmail, Yahoo! Mail, AOL, Exchange, and other email accounts. 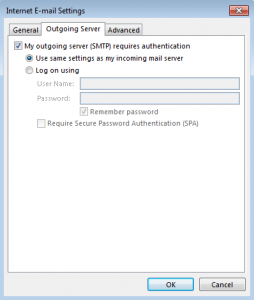 Moreover, you can set up multiple email accounts on Outlook to access your mailboxes right from your desktop. 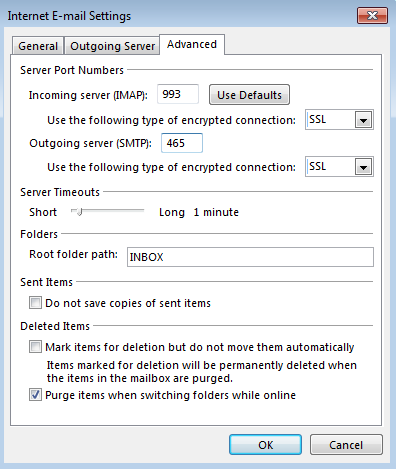 Apart from Outlook, many email clients support IMAP (Internet Mail/Message Access Protocol) in addition to POP (Post Office Protocol) for email downloading messages from the server. 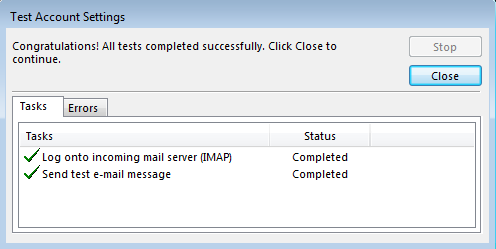 However, IMAP, unlike POP3, leaves a copy of each message on the server until you delete it manually. This makes IMAP a preferred email protocol. Alike earlier versions of MS Outlook, the most recent version also supports email accounts based on IMAP, POP, and Microsoft Exchange Server. 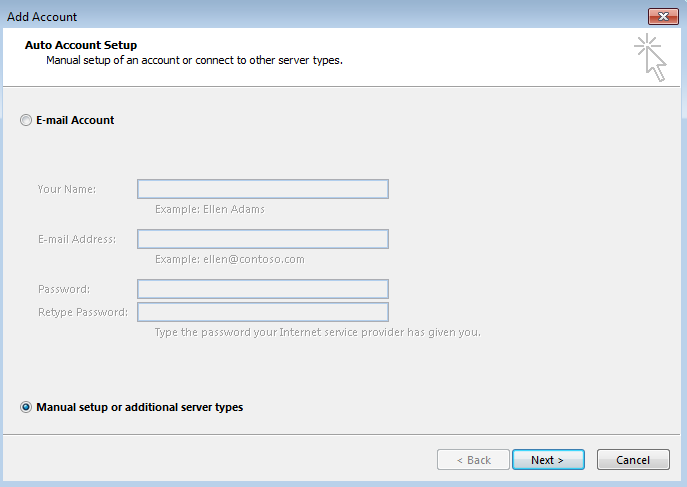 However, you may not see the email configuration steps exactly same as they are in the later version (i.e. Outlook 2010). 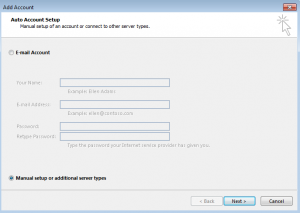 See how you can configure your IMAP account on Outlook 2013. Launch Outlook 2013, click File tab and then click Add Account. Click Manual setup or additional server types, and then click Next. 3. Select the last option, i.e. POP or IMAP and click Next. 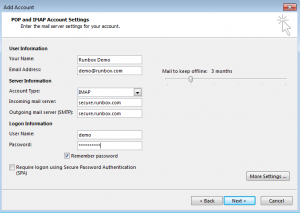 4.On the POP and IMAP Account Settings window, specify the required information, and then click More Settings option. 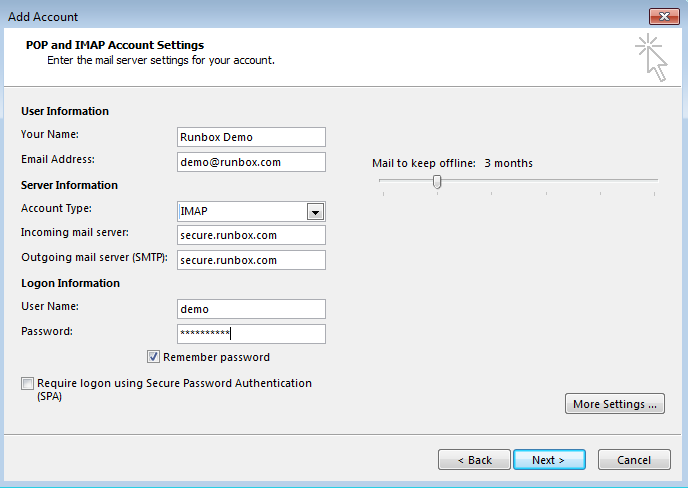 Note: Make sure you select IMAP in the Account Type drop down menu under Server Information. 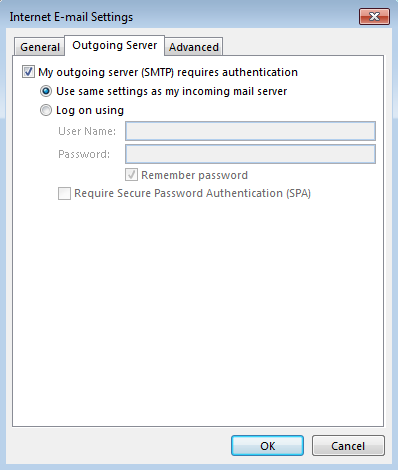 On the Internet E-mail Settings dialog, click Outgoing Server tab and check the “My outgoing server (SMTP) requires authentication” check box, and then click OK.
6.This will land you on the POP and IMAP Account Settings window. Click Next to start email configuration. 7.Click Finish when Outlook is done. 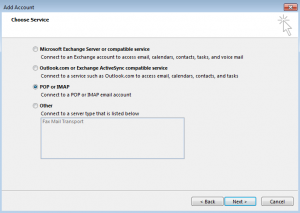 This is the right way to set up your IMAP account in Outlook 2013. However, Outlook 2013 and Office 365 users face synchronization issues with IMAP and fail to access their mailbox items. In order to find out the exact causes of the issues appeared, you must delve a little deeper to get to know about the same, which brings the culprits (i.e. KB2837618 or KB2837643 update for Outlook 2013) in spotlight. You may also try setting up your Outlook profiles again with the IMAP protocol, but make sure you implement these settings to avoid the same issues again. In case you encounter issues like mailbox inaccessibility or you fail to access the contents of one or more folders in the mailbox, go for Stellar Repair for Outlook, as it might be due to PST corruption. Getting the Outlook PST repaired will fix all these issues, but you must be sure about how to use this software. Hope, you’ve found above solution helpful! After spent much time on manual solutions, I must say Stellar PST repair tool is better way to resolve the error. Tool is easy, and done the job at very first attempt. Cheers! Glad to know that you find Stellar PST repair tool a worth solution to fix the issue. b) if, when the folders tab is opened, IMAP Folders existed. It does not exist in my Outlook 2013. In the customize ribbon IMAP is listed but not displayed in the ribbon. IMAP Folders is greyed out and cannot be added. Creating a custom folder titled IMAP2 displays in the ribbon but IMAP folders is greyed out (not functional. Similarly, update folders is greyed out / non-functional. Neither of the described updates are or ever were installed on my system. Outlook can access and retrieve mail from my imap inbox when I spam the send/receive all button a few hundred times but my folders do not sync at all. This all worked perfectly with Outlook 2007 & 2010… but in 2013 it is broken and all of the reported fixes are impossible. I can follow the path right up to dead ends where what is described in the fix description fails to reflect what exists or can be accomplished in outlook 2013 installed on my system. Try to repair your Outlook profile or create a new profile and check again. Let’s see if it does help. I just set up an IMAP account in Outlook 2013 and noticed two “Sent” folders. The first one contains the messages sent from the webmail and my devices (smartphone and tablet) and the second one contains the messages sent from Outlook only. Is there a particular setting (to instruct Outlook) to save the sent messages in the Sent folder on the server and not in the local folder? I used the fix of changing the root folder to Inbox, and now I am missing some key work folders and cannot get them to return. I removed Inbox from the Root folder, and they did not return. Does anyone have any suggestion on how to get these folders/email back? Did my Outlook data file get replaced on the C:\? @Bill, Did you find your folders? If so, how? This practice can’t hamper Outlook data file because I believe that you haven’t deleted emails. You should contact your IT administrator to reconfigure your Outlook mailbox folder hierarchy. Same thing happened to my client (as Bill, above). Where can I get information on reconfiguring the Outlook mailbox folder hierarchy? The junk email folder in office 365 is not syncing with outlook 2016. Kindly advise on ways to work around this issue. I will appreciate if you can help in this regards. I am also unable to synchronize “Empty Folder” and “Junk E-mail” folders. I think Outlook 2016 doesn’t support synchronization for the least important folder like ‘Junk Emails’. Last month, My Outlook 2016 email had encountered a bug like error i.e. “can’t delete IMAP email”. Then, I did changes in Outlook settings as mentioned in the above guide. Thanks for a dedicated tech support.